At 0500 BST, about 30 seconds after an on-screen message saying UK viewers were watching Lost: Live from the US - its first and last simultaneous UK/US broadcast - another screen popped up reading Temporary Fault. Oops. Luckily the message lasted only a few seconds before normal service was resumed, and so began one of the most anticipated television finales in recent history. 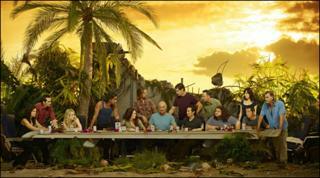 Anticipated because in the six years since Lost began, it has had the power to enthral and infuriate in equal measure. It launched with what is still the most expensive pilot episode in TV history. The initial concept was pretty simple - a plane crashed on a mysterious island and the survivors soon found themselves locked in a constant battle against The Others - a hostile group of island residents and some kind of monster that lived in the bushes. In series two, we found out that people had been on the island for some time and we learned all about the Dharma initiative. All good so far but then the series seemed to lose its way when it started flashing forward to a future with a dead John Locke, a bitter drug-addicted Jack and the rest of the Oceanic Six living out their "normal" lives. The show had become so complex that any rational explanation to the question: "What is it all about?" was always going to be a tough one. The cynics questioned whether writers and head honchos Damon Lindelof and Carlton Cuse had any idea where it was all heading. So, the final episode. The finish line. The finale. The end. Was it all worth it? Honestly, the show ended the only way it could have possibly ended. It was emotionally satisfying while some of the questions were answered and yet others will remain a mystery. All in all, the show was wrapped up rather nicely with a positive affirming kind of message. It all began with Flocke (as in Fake Locke, or the Man In Black) having vowed to destroy the island with the help of Desmond, taking him to the island's life source. Jack, having volunteered to be Jacob's replacement on the island, had the same idea, but rather than using Desmond to destroy the island, he had vowed to kill Flocke. Desmond did not end up destroying the island. He came very close but by unplugging the island's light source, he succeeded in making Flocke human, thus allowing Kate to kill him with a shot to the back. Was this a bit of a disappointing end to the Man In Black, the chief antagonist of the last season? Possibly, and a slightly unfair one as well. The Man In Black (he never even got a name) certainly got a bit of a raw deal when goody-two shoes Jacob threw him into the light source some two thousand years earlier, robbing him both of his body and his humanity. Was he all bad? He certainly was a bit of a trouble-maker who carried out a few terrible deeds. But in the Across the Sea episode of season six - we saw a man who saw the limitations of his life on island and saw his destiny elsewhere. By killing him, there, was no chance of his redemption. Also, surely killing him resulted in a loss of balance on the island. All of Lost's imagery pointed to good and bad co-existing, the black and white stones, the struggle between light and dark. In the struggle that preceded the fatal shooting, Jack was mortally wounded and resolved to stay and repair the island. Hurley went with him and Jack made him his successor as island protector. Meanwhile, Sawyer, Kate, Claire, Miles, Richard and Lapidis managed to get the plane working with the help of some duct tape and flew off the island to safety. Meanwhile, the flashes sideways continued as the survivors were all drawn together at the music concert at the Widmores. Locke had accepted Jack's offer of surgery and was now capable of walking unaided. Hurley took Sayid to a bar where - after stopping a fight - he was reunited with Shannon. Sun and Jin were reminded of their time on the island as they saw the ultrasound of their baby and Sawyer and Juliet met again in a touching scene by a snack machine. As early as the first season, there were suggestions that no-one survived the plane crash and the island was some sort of purgatory. Close but no cigar. The island was real and as Jack's dad Christian Shephard ( ... Kate was the one that spotted it. Really how did we all miss that one?) pointed out "everything that happened, happened". Instead, we learned that rather than being some some kind of alternate-timeline, the flashes sideways were glimpses of a kind of limbo between life and death. In their deaths - some on the island, some much, much later - they were all pulled together to move on to the afterlife. The people that meant most to them during their lives would be there with them as they moved on to the next plane of existence. With various philosophies running throughout the entire series, the final scenes took place in a multi-denominational place of worship. There were some genuinely moving touches, Ben remained outside the gathering, not quite ready to leave his own personal purgatory and forgive himself for his sins. Yet Locke did offer him gratefully accepted forgiveness and Hurley, who invited Ben into the gathering said he was a "good number two", with Ben telling Hurley he was a "great number one". We were left to assume that the two men acted as protectors of the island for some time. It ended as it had begun with Jack lying in the same bamboo forest in which we first met him in episode one. Back then Jack opened his eyes for the first time on the island, this time around he closed them for the last. Yes, the finale could be accused of being a bit melodramatic and certainly there were many issues left unaddressed. Whatever happened to Michael and Walt? What was the significance of the Egyptian statue on the island? What about the temple? Why, at the beginning of this series, was the island underwater? Discussions will likely rage for years to come but if there is any lesson from the final episode, then it is that sometimes you just have to let go.